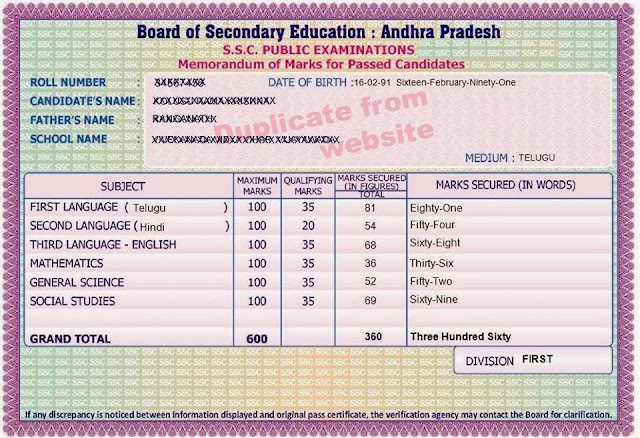 Anyone lost their Andhra Pradesh SSC/10th Class certificate? You can get Duplicate Certificate Marks Memo download from online and take printout. How to get Duplicate SSC/10th Class Certificate online from website in Andhra Pradesh. Fill the following details like, Hall Ticket Number, Date of Birth, Year of Examination, Stream of Examination and then submit the details. you can get the duplicate certificate. Fill the form and submit the application through your School Head Mastor. Note: The following certificates should be sent alongwith the application without fail. 1. Treasury Challan for Rs.50/- remitted to the Head of Account given in the column 12 supras. 2. An affidavit on a stamp paper worth Rs.10/- to be attested by I Class Judicial Magistrate. Designation stamp of the First Class Judicial Magistrate should be affixed. 3. A declaration by the candidate regarding the suspension or cancellation of his certificate previously by the competent authority. (to be attested by the Head of the Institution concerned). 5. True extract of the Original Secondary School Certificate (it will be issued by the Headmaster). Note II: If the spoiled S.S.C is available or in case many pieces of its are available may be send to this office alongwith the application. 7. Certificate issued by a Sub-Inspector of Police or a Certificate issued by a Deputy Tahsildar as the case may be ________________________as per column 9 Supra. Certificate through Mee Seva Centers: AP Govt connecting SSC Duplicate Certificate services through Mee Seva Centers. Now you can also apply duplicate SSC Certificate through Mee Seva Centers. You can get the duplicate certificate through Meeseva Centers within 1 week to 2 weeks period.